Did you know that we sell almost all the specialized equipment you need to build a treehouse? Over at the supply side of Nelson Treehouse and Supply (that is, Be in a Tree at store.beinatree.com), we offer treehouse plans, fasteners, and heavy-duty hardware - the same stuff we use in every single one of our treehouse builds around the world. We only sell products that we can personally vouch for as being the highest quality out there. And DIY-ers agree that our gear is the greatest: our TABs have continuously sold out this spring and summer (but don't worry, we just got Standard TABs back in stock!). Today, we're giving an overview of our one-stop treehouse shop at Be in a Tree. From original treehouse designs to the best star drive screws on the market, we've got your next treehouse build covered. Pete created our collection of treehouse designs to help simplify the most daring of treehouse DIY projects. 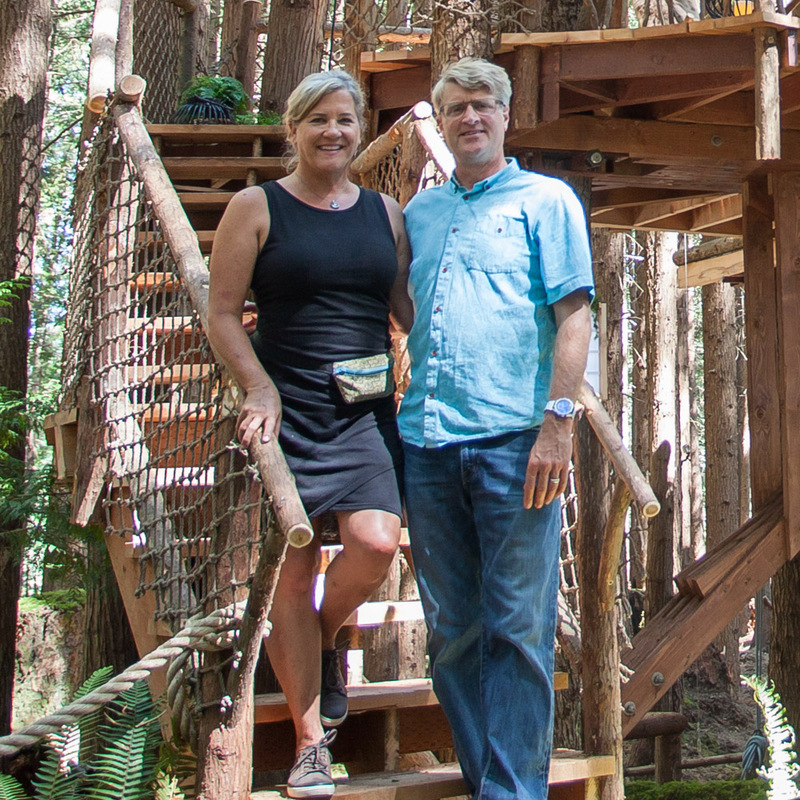 Some of these plans are based on his iconic treehouses at TreeHouse Point, others are modeled after fan-favorites from Treehouse Masters, and a few are inspired by treehouses he loved as a kid or built for his own children. All of Pete's plans are made for modification to fit your trees and lifestyle. We just updated our plans—so if you've browsed them before, you'll notice some changes. We throw in a free copy of the ever-so edifying Treehousing: The Instructional Guide with each set of treehouse plans. You can see and shop our full selection at store.beinatree.com/collections/plans. Our high-quality treehouse hardware is burly. It's beefy. It's the toughest stuff on the market. We've got all the hardware you need for your treehouse build from essential TABs, to uplift arrestors, to suspension systems, and more. This is the same hardware Pete trusts for every treehouse he builds. It's the same hardware he installed in each of his treehouses at TreeHouse Point. And it's still holding strong in those treehouses that are over a decade old. We also specialize in designing and fabricating any piece of hardware you might dream up for your treehouse project. Whether you're designing a custom steel yoke or angle bracket; coordinating with your local fabricator; or in for the full design, fabrication, and freight package - we can make it happen. Click here to learn more about our custom hardware fabrication services. Our crew exclusively uses Screw Products Inc. star drive screws in every treehouse build. Imagine a screw that will never strip out, that has twice the torque of most other screws, and that significantly reduces camout. Imagine a screw that could practically drive itself. Now stop imagining—what if we told you that such a magical screw is a real thing? That's right, it exists: the best screw of your life. This is actually true: Nelson Treehouse workwear and apparel is so cool, so tough, so classy that our crew members voluntarily wear it to work everyday. We're not kidding—not a day goes by without at least one of our crew members donning NT&S regalia. If you walked into our office, you'd think our crew has more team spirit than a high school cheer squad. While they do indeed boast a healthy dose of team spirit, the real driving force their fashion sensibilities is the high quality of our team gear. Luckily, we sell the same apparel our crew loves online to the public at store.beinatree.com/collections/apparel. From tool vests to T-shirts, snapback hats to double-thick sweatshirts, we've got you clothed for the gnarliest of treehouse builds (or the chillest of summer BBQs). We hope you've enjoyed taking a tour of our one-stop shop for the best treehouse equipment! Let us know what you're dreaming up for your next treehouse build in the comments below.